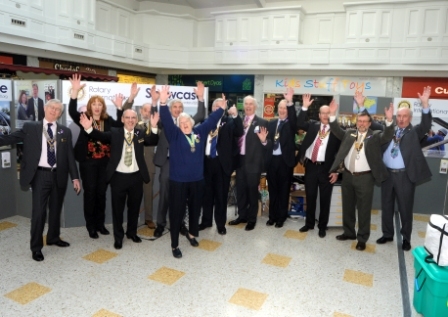 ‘Showcase’ is the name of the Rotary Awareness event held in the Arndale Centre Eastbourne on Saturday 25th February and Wednesday 29th February. On Wednesday, the display and Presidents of all the clubs represented were visited by the U.K. Rotary President Ray Burman, and District 1120 Governor Lynn Mitchell. The Showcase event was an opportunity for the twelve Rotary clubs in the area to show what achievements they had made in the last year, and to continue the ‘#End Polio Now’ campaign which has raised over 200 million dollars worldwide in the last four years. The twelve clubs from Hastings to Eastbourne, and including Battle, Heathfield and Hailsham have over 350 members and are involved in both local and overseas fund-raising and charitable projects, which were clearly illustrated. Also on show was a ‘Shelterbox’ tent and equipment. This is a British Rotary initiative to supply accommodation for disaster victims, which is strongly supported by clubs in the Sussex area. During the two days, members of the public talked to Rotarians about their voluntary work, and contributed to the fund raising appeal.